The exhibition will feature the largest collection of philatelic and numismatic items on show in Australia since 2005, and will also mark the centenary of the 1913 Kangaroo and Map stamp - Australia’s first national postage stamp. It will be attended by national and international dealers, traders, collectors and postal administrations, including New Zealand Post. To celebrate the exhibition, New Zealand Post is issuing an exhibition miniature sheet and souvenir cover. 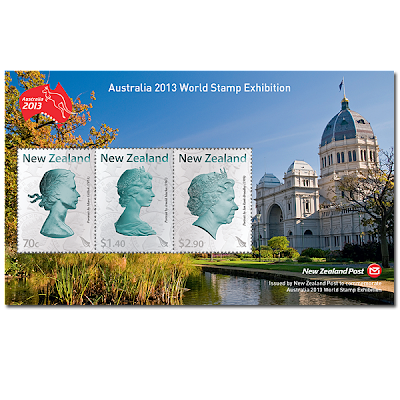 The miniature sheet incorporates stamps from the Queen Elizabeth II - 60th Anniversary of the Coronation stamp issue, set against an image of the exhibition venue - the Royal Exhibition Building.